Balconies with bronze-toned frames break up the brick exterior of these three housing blocks in northwest London by Alison Brooks Architects – a finalist for this year's Mies van der Rohe Award. Brooks' London firm designed Ely Court to create 44 new homes as part of the South Kilburn Estate Regeneration Masterplan – one of the largest regeneration schemes in London. The 6,509-square-metre complex is made up of three residential blocks named Terrace, Link block and the Flatiron arranged around a garden square. Alison Brooks Architects responded to a number of post-war buildings surrounding the site, including a 1960s housing block, Victorian semi-detached villas, a Salvation Army centre and a former pub. "The design is driven by a contemporary reinterpretation of the block-and-street urban grain that characterised the area before its post-war redevelopment with residential blocks set in open space," said the architects. Facing onto Chichester Road, the four-storey Terrace block includes a mix of single-level and duplex flats. Their design is intended to reference the 19th-century mansion blocks of neighbouring Maida Vale. On the front, the bronze-toned balustrades – made from powder-coated aluminium – frame porches and covered terraces above. For the upper two levels of apartments, balconies are recessed into the brick facade to offer privacy to the residents. These balconies also feature in the eight-apartment Mews, which runs parallel to the Terrace, to offer views to the green area in between. "The more active street elevations ensure that public spaces are all well overlooked by windows, residents' balconies and roof gardens," said the firm's founder Alison Brooks. The serrated roof of the Mews block allows plenty of sunlight into the mix of two, three and four storey residences. Located in the corner of the triangular site, the Flatiron block connects to the old pub and faces onto the both the street and the green space between. Inside, each of the flats has a tall ceiling of 2.6 metres and full-height glazed doors that create bright and spacious homes. Commissioned by the London Borough of Brent and Catalyst Housing, Ely Court is half social and half private housing, generally exceeding the London Housing Design Guide standards. "The scheme demonstrates the ability of a local authority to lead the process of enlightened city building, by commissioning and delivering housing of the highest calibre to integrate previously segregated communities," said Brooks. 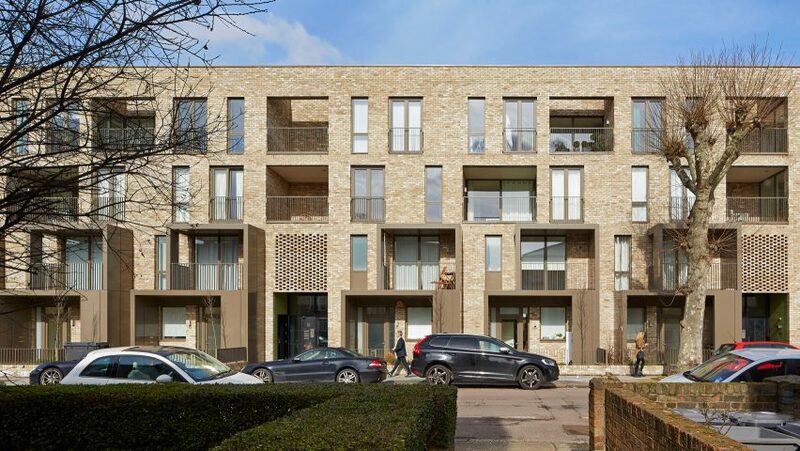 Ely Court marks the first of three projects that the Alison Brooks Architects is set to complete for the South Kilburn Estate Regeneration Masterplan. Ten other practices are also working on the £8.2 million regeneration programme that aims to transform the area over the course of 15 years, and provide 2,400 new homes. Alison Brooks Architects came 157 in Dezeen's Architects Hot List ranking, a guide to the most newsworthy and searched-for players in the design world in 2016. The firm was founded by Alison Brooks, who was born in Canada but now lives in London. Past projects by the studio include a giant inhabitable smile using cross-laminated tulipwood, a suburban housing development in Essex and two tapered extensions to a house in north London.